The delicious stuffing features ground beef, brown rice, golden raisins and almonds seasoned with a flavorful Super Spice combination. Preheat oven to 375 degrees F. Mix rosemary, cinnamon, oregano and sea salt in a small bowl. Set aside. Cook ground beef in a large skillet on medium-high heat 5 to 7 minutes or until no longer pink, stirring occasionally to break up meat. Drain fat. Add spice mixture; cook and stir 1 minute. Stir in tomato sauce, raisins and almonds. Bring to a boil. Remove from heat. Add rice and egg; mix well. 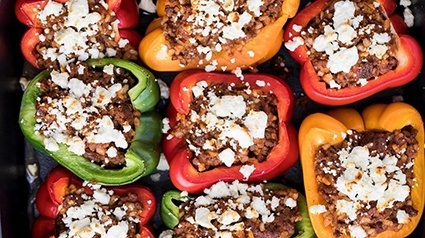 Arrange bell pepper halves, cut-side up, in 13×9-inch baking dish. Spoon beef mixture evenly into bell pepper halves. Pour 1/4 cup water in dish. Cover with foil. Bake 45 minutes or until bell peppers are tender. Sprinkle filling with feta cheese. Bake, uncovered, 12 to 15 minutes longer or until cheese is lightly browned.